No matter what your specific needs are, there is an awning fabric for you! When it comes to designing your commercial awning, the possibilities are endless! There are so many styles, patterns, and colors to choose from to really make your awning stand out from the competition. There are also several different awning fabrics available, each with their own look and benefits. 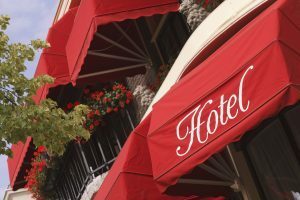 Here are the four types of awning fabrics to help you narrow down your decision. This type of awning fabric is known for its strength and translucency. Vinyl laminated awnings are quick-drying, making for a fast and easy installation process. In addition to being durable, they are also wrinkle resistant. Their translucency makes them good for adding a backlit feature so that your awning will light up the night! Acrylic awning fabric is more of an upscale material to use. The better quality acrylics are designed to resist UV rays, mildew, and water, increasing the lifespan of your awning. Certain acrylic awning fabrics are solution dyed, meaning the colors are added while the fibers are still in a semi-liquid state, embedding the color into the fabric. This means you won’t have to worry about the color fading. These awning fabrics are probably the most versatile in comparison to the other options. This is because shade cloth comes in a variety of different styles depending on your specific needs. They offer high quality outdoor fabrics that are durable and water-resistant as well as indoor options that aren’t made to protect from UV rays. They are available in an array of colors and patterns to compliment anyone’s personal style. This was once the standard fabric that most awnings used, but is now generally used for areas that have extreme cold weather. It’s a fabric that is both strong and flexible which makes it good for the cold and wind. It also has a self-contouring ability that is unique to the cotton material option. These awning fabrics are both water and mildew repellent. Contact Carroll Architectural Shade Today for Your Commercial Awning!